It is open to all Malaysian citizens aged 18 and above with a valid MyKad as of March 1,2018 with children or wards aged between 1 day to 3 years and 11months as of March 1, 2018. Purchase any Botaneco Garden Baby product from any Guardian store, or from the Guardian e-store. Take a creative photograph of your child as a Little Eco Warrior. The Botaneco Garden Baby product should be clearly visible in the photograph. Creatively caption the photograph and post to BOTH your Facebook and Instagram accounts. Include the hashtags #MYBotanecoGardenBaby #MYBotanecoGarden and tag @GuardianMalaysia. 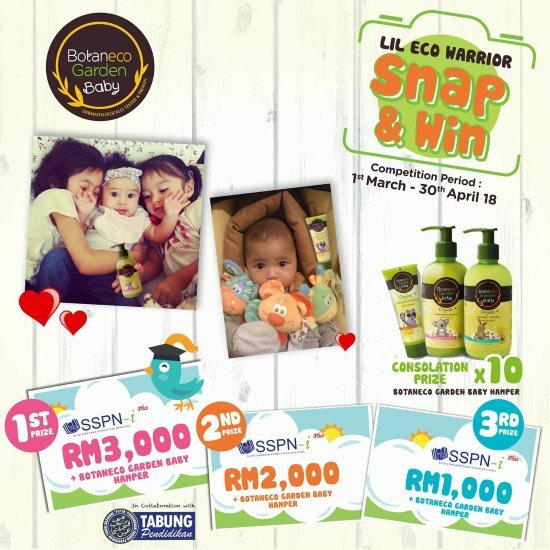 Visit Botaneco Garden Baby Lil Eco Warrior Contest terms & conditions for more details.